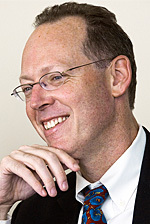 Internationally renowned medical anthropologist Dr. Paul Farmer delivers the Lawrence University convocation “In the Company of the Poor” Tuesday, April 22 at 11:10 a.m. in the Lawrence Memorial Chapel. He also will conduct a question-and-answer session at 2:30 in the Warch Campus Center. Both events are free and open to the public. Farmer’s convocation also will be webcast live at htttp://www.livestream.com/lawrenceuniversity beginning at 11 o’clock. A professor of global health and social medicine at Harvard Medical School, Farmer pioneered community-based treatment strategies of high-quality health care in impoverished settings worldwide. Named one of the “Best 100 Global Thinkers” by Foreign Policy magazine, Farmer is a founding director of Partners in Health, an organization dedicated to providing health care to the world’s poor. He was recognized with a John D. and Catherine T. MacArthur Foundation MacArthur “genius” fellowship in 1993. Influenced as an undergraduate at Duke University by the liberation theology of Catholic clergy resisting dictator rule in Central America and the public health practice of 19th-century German physician and scientist Rudolf Virchow, Farmer felt compelled to improve the situation of global health among the world’s poorest populations. Farmer began working toward that goal in Haiti while completing his medical degree and medical anthropology doctorate through Harvard Medical School. Over a decade’s span, he introduced medical techniques that cured infectious diseases for a fraction of the cost such treatment would be in a U.S. hospital. These cost-effective, high-quality technologies have since been implemented by Partners in Health in the Navajo Nation in the United State as well as in Lesotho, Malawi, Mexico, Peru, Rwanda and Russia. Farmer’s efforts were chronicled in Tracy Kidder’s New York Times bestseller “Mountains Beyond Mountains: The Quest of Dr. Paul Farmer, A Man Who Would Cure the World.” Farmer has written extensively about global health and human rights and serves as U.N. Special Adviser to the Secretary-General on Community-based Medicine and Lessons from Haiti.